During the school holidays when I was a kid my mum would take us on regular day trips to Gawler. As a kid, to be honest, I found Gawler boring because there was no park with any play equipment, with the exception of the cannon located in Pioneer Park. Since we would occasionally have picnics in this particular park we, or at least myself, would climb all over the cannon, and occasionally attempt to shoot it (with no luck). Even though I did find the place a little boring, it still held some fond memories, and when I discovered that there were ten pubs here, I felt obliged to pay the town (or is it a suburb) a visit on my recent trip to Adelaide. Of course my brother, who loves going to Gawler, wanted to come along, and didn't care that one of the things that I wanted to do was to pay a visit to all of the pubs. As you probably noted in the title to this post, Gawler is South Australia's second town, being established in 1836 (which is the same year the colony was settled). Okay, Wikipedia claims that it was South Australia's first town, but I suspect that they were not counting Adelaide when they posted that, though I am because at that time I suspect Adelaide was little more than a town, despite it being the capital of the new colony. Like Adelaide, Gawler was planned by Colonel Light, however unlike Adelaide it was planned on a triangular fashion, this being dictated for the fact that it was established at the confluence of the North and South Para Rivers, which join to become the Gawler River. It was interesting to note that Gawler was planned by Colonel Light because it did not seem at all like Adelaide, with the main street (Murray Street) running along one of the edges of the triangle as opposed to through the middle. There are also a couple of squares, though they sit in the middle of the residential area (sort of because I am not sure if the original part of the town is entirely residential anymore). Gawler became a prosperous little town due to the discovery of copper to the north and became a 'resting stop' for deliveries to Adelaide. However, from what is evident, it was initially established to support regional farms. With the development of the wine growing region in the Barossa to the east, Gawler has effectively become the gateway town, as well as being a place where people who work in Adelaide can live in quiet country surroundings (though the encroachment of the suburbs from the south will, sooner or later, cause this to change). Well, I did come to Gawler to visit the pubs, so I guess I should give you a brief overview of them all, as well as a quick opinion as to whether I like the particular pub. If you wish to find out more about the particular pub, you can always read my review on Truelocal.com.au (depending on whether I have posted the review). The number on the map corresponds to the particular pub below. Basically this is what I call a Woolworth's pub, namely because it is owned by the ALH Group, which in turn is owned by Woolworths. What that means is that it has a sports bar, a restaurant (which usually, but not always, sells cheap food) and a bucket load of pokie machines. The pub still has its original charm, as long as you look at it from the outside. Other than a pretty nice beer garden, there isn't much else that thrills me about this pub because, well, the only other thing in this pub are pokie machines. I came here for some lunch and all they could offer my was a toasted sandwich. If I wanted a toasted sandwich I would have stayed home. I thought this pub would have a better website than the Sip 'n' Save website, but then again I guess not. The pub it okay, and it has a Fat Yak craft beer bar, as well as some funky murals on the toilets, but other than that, I didn't really consider this place all that fantastic (especially since they didn't even offer me a toasted sandwich when I was looking for some food). Okay, it has a funky website but that is all I can say about this place because, well, it wasn't open when I went past. However it looks like it is trying to be a little more trendier than the surrounds, but as I said, it wasn't open so I can't say all that much about this place. Well, if it wasn't for the pokies out the back I would think that this was basically a family restaurant (the play equipment gave that away). As a restaurant though it was pretty ordinary, and they didn't even cook my steak right. At least my brother liked the Chicken Schnitzel. Well, according to the website, this pub was originally called 'The Golden Fleece' but then changed its name to 'The Old Spot Hotel' only to revert back to its original name with its recent transformation. I suspect that may have something to do with distancing itself from the 'Old Spot Hotel' down in Salisbury (or it could simply be to give it a makeover). Anyway, this pub seems to be the trendy pub with a decent selection of craft beers, and a really cool beer garden, which sort of adjoins the arcade that runs down the side. This pub seems to have everything, including, unfortunately, pokie machines. However this is a pretty large pub with two beer gardens, as well a tables out the front on Murray Street. What was impressive was that one of the beer gardens was completely non-smoking, which means that people have have a decent meal (while cooking their steak on a really hot paving stone) without having to deal with smokers. Well, this place really didn't impress me all that much because, like the Gawler Arms, this was a restaurant with pokie machines out the back. One of the things that I really don't like about these restaurants (if you can call them such) is that they try to market the restaurant as a family restaurant, yet have signs telling kids not to go into the pokie rooms (though no doubt the parents do). I would have to say that this is probably the best pub in Gawler, even if it is only because there are no pokies inside. To me, though, it felt like a cross between a trendy pub and an old style country pub (though they don't seem to have a website, nor do they have any craft beers on tap). However the beer garden was really cool, especially having a set up for live bands (though the neighbours are probably not all that impressed). Well, I wonder how I can write a paragraph that basically says 'nothing to see here' because, well, there isn't all that much to see here. That is a bit of a lie because I'm sure the address can get confusing at times, and there is also a view of the railway station, but you don't need to go into the pub to see that. So, after reading the above you probably are thinking that the only things to see in Gawler are the pubs (actually, you are probably thinking that I am an alcoholic, but that is beside the point). In fact, there are more things to see in Gawler than just the pubs, and it is more than just a stop off on the way to the Barossa. Okay, maybe some of the things only interest me, but I think we should give Gawler more credit than a place to go on pub crawls. Any place that has a park called 'Dead Man's Pass' has to be a cool place to visit, even you there aren't actually any dead men in the park (which is probably a good thing because I know I don't want my dog, if I had one that is, digging up some corpse). There is a little plaque that tells us why they call it Dead Man's Pass because back in the colonial days, when Colonel William Light was scouting the area, they came across the skeletal remains of a human dressed in colonial clothes. I'm not even sure if they knew who it was, and Adelaide's Haunted Horizon's seems to suggest that the identity may be a mystery. However, Alan Tiller, who writes about the ghosts of Australia in his blog mentions that this wasn't the only person to have met a fatal end in this gorge. However, what I did notice as I was wondering around was that it is interesting that the gorge got its name from the discovery of a dead colonist, though I suspect that a number of the original inhabitants, the Kuarna people, would also have met a rather grisly end here as well. When I was a kid we would always cross this railway bridge over the North Para River to get to Gawler Central Railway Station, however just before the bridge another line split to head north and went across another bridge. I would always stare out of the window of the train in wonder looking at this railway bridge wondering where it went and why we never caught a train that went down there. Years later I discovered that it went north to Kadina and the copper mines, and the reason we never caught a train down there was because the public transport never took that line. So, this time on my trip to Gawler I decided that I would walk down to these bridges and have a closer look at them. Okay, I stayed well away from the bridge that the metro trains use because, well, I didn't want to get caught halfway across to bridge to discover a train coming towards me, however I decided to take a chance and check out the other bridge. As it turns out it is no longer used, namely because on the other side of the river the trees have grown over the railway line, and there are numerous weeds growing in between the tracks. That told me that it basically isn't used any more because, well, if there were trains coming along here the trees and shrubs would have been removed. Apparently this was where Gawler's first cemetery was located, which now gives me second thoughts about coming here because they moved the headstones, but nowhere do they say that the bodies were removed. Oh well, I guess it is a good thing that I am not superstitious. However, now it is a lovely little picnic ground where we used to have lunch when we were children, and also play on the cannon. The thing that stands out to me though is the little structure on the footpath running along Murray Street. Oh, and if you are really hanging out for a beer, you can always enter the Exchange Hotel by the rear entrance. One of the things that I love about these old colonial towns is that many of the original buildings are still present. In fact next to the town hall is the library and one of the banks, while another bank is on the other side. I also believe that there is a museum around here, but since it was closed when I was wandering down here with my brother, we did not have an opportunity to look inside. However, while the old bank buildings have that olden day look about them, having the modern logo sticking out on a plastic sign sort of destroys some of that historical feel about the place. In a way, these plastic signs drag you out from those bygone days and thrust you back into the modern world. Maybe the building needs a bit of a paint job. Well, if you thought the Gawler Central Railway Station was impressive, then the Gawler Station is even more so. 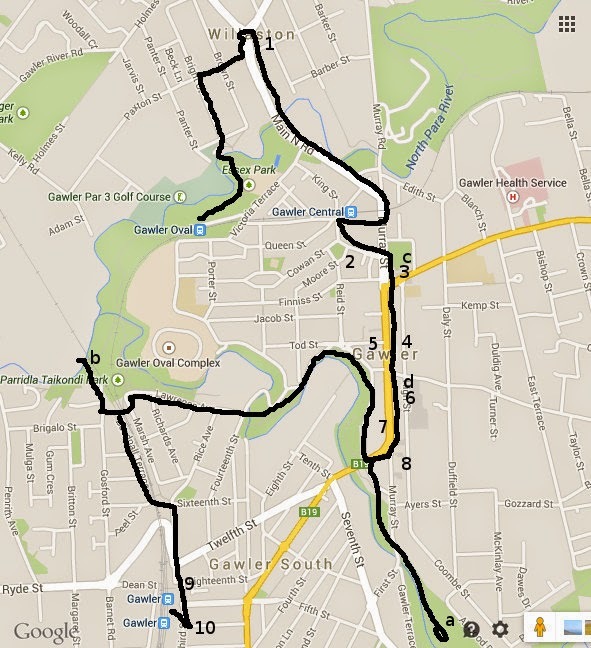 However, unlike Gawler Central, it is a little more of a hike to the town centre (which is probably why we always got off at Gawler Central). The Gawler Railway station was originally established as the terminus of the track from Adelaide, however when the line to the Barossa was built the station at Gawler Central was constructed to allow easier access to the town. One of the reasons that the main station was so far from the township was that during the age of the steam trains local residents were worried about the town being enveloped in smoke, as well as concerns that sparks from the engine would set fire to the local properties. To solve the problem with the distance of the station from the township a horse drawn tram was established to transport people to and from the station. While the days when the station was fully staffed are long gone, there is still a cafe located inside, and I believe there are still a couple of people here to assist passengers. However, from what I read, the station now doubles as an art gallery which displays local works of art. I didn't have a chance to look inside because it is only open on weekends, and I didn't even know about the gallery until I read about it on the wikipedia entry. However next to the railway station is a shed in which there is an old steam train. The train used to be located elsewhere in Gawler however lobbying by a local community group (I believe it was the Lyons club), had it moved here were it is in the process of being restored. The final thing I wish to say about this town are the old buildings that are scattered about. This is probably not surprising since the town was established in 1836. Okay, maybe the racing track is not as old (and I believe they still race horses there), and the semi-detached housing trust homes encroach on the town centre, but there are still a lot of quaint old houses scattered across the place (many of them interspersed with more modern houses when the owners of the land decided to make a quick buck through the wonders of subdivision). The building in which the local paper, The Gawler Bunyip, is published till has its offices on the main road in an old 19th century building (though I suspect that it is probably printed elsewhere). However, instead of rabbiting on about nothing, I'll finish off with some of these old buildings.